I hope everyone has had a great Thanksgiving weekend! It's been a cool, but not atypical, weather weekend with cloudy skies on Thursday and most of Friday and sun re-appearing today. Temperatures have peaked in the mid 50s the past couple days. Sunday will see a return of high cloud cover ahead of the next storm system that is the main subject of this blog. Temperatures Sunday will start chilly - in the 30s - but climb to the mid 60s as south wind brings in warmer air. 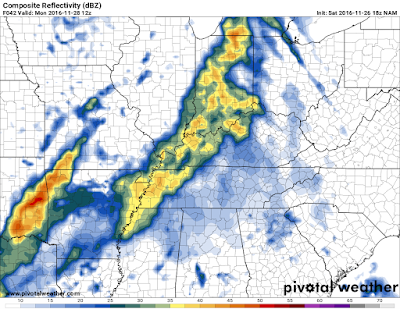 On Sunday night, we'll begin to see the early stages of a major weather system that will traverse the Mid-South on Monday. Clouds thicken and lower and south wind increases further overnight with scattered showers moving into the metro before dawn Monday. The morning rush hour will likely be wet and breezy with temperatures in the mid 50s. This pattern continues through the morning hours with temperatures rusing into the low to mid 60s as dewpoints (humidity) continues to increase as Gulf moisture moves into the region on gusty south wind. 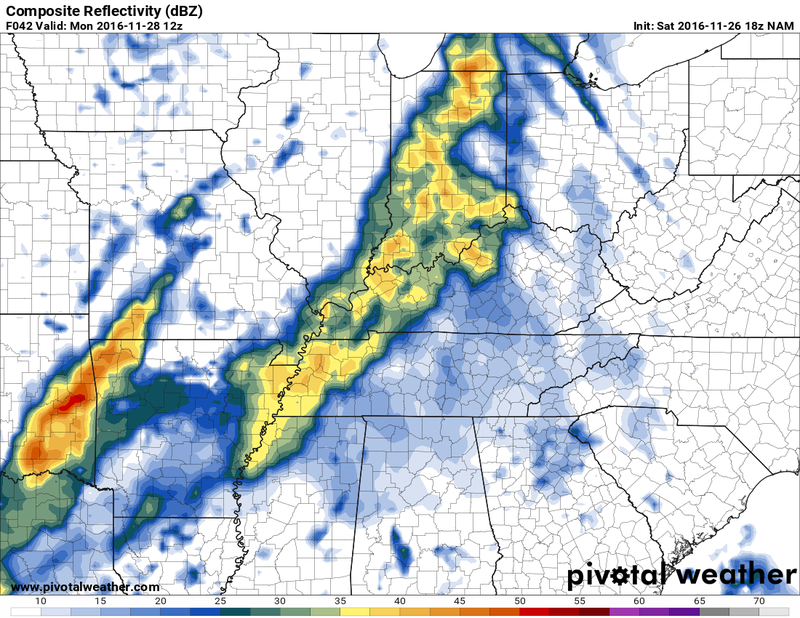 Monday afternoon and early evening will be the timeframe of greatest impact. A couple of factors will be key: 1) wind in all levels of the atmosphere will increase markedly as the day goes on, and 2) atmospheric moisture content will be very high (likely in the 90th percentile for this time of year). These factors will contribute to torrential rainfall rates and strong, gusty wind above 30 mph, especially after lunch into the evening rush hour. Though some thunder is possible, atmospheric instability is actually very low with this system, despite impressive atmospheric dynamics. 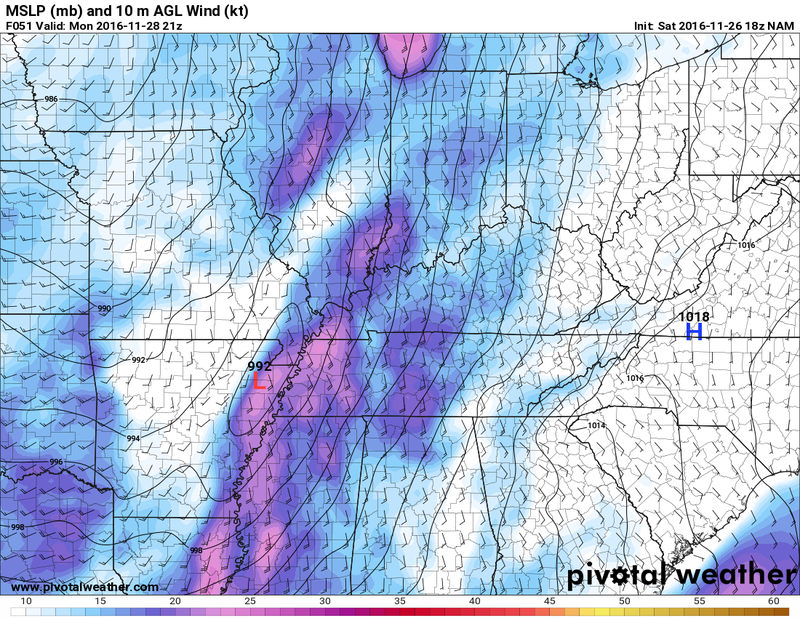 High rainfall rates could actually help drag some of the wind from a screaming low level jet stream (up to 65-75 knots [75-85 mph] at 5,000 feet) down to the surface, which could result in some severe level gusts without thunderstorms actually occurring. 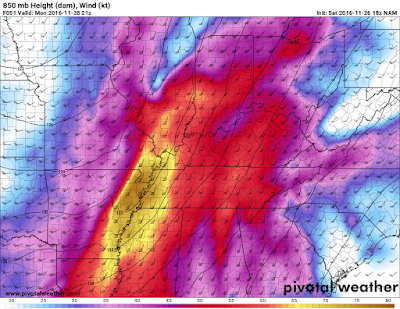 In addition to the strong surface and low level wind, a very strong upper level jet stream of 150 kts (>170 mph) will be over the area, helping to increase the overall strength of the system. 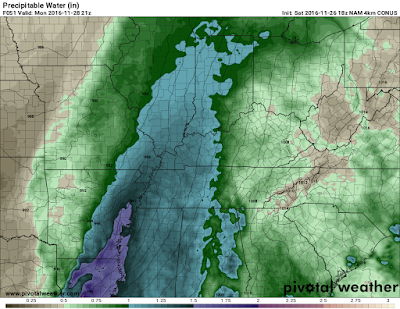 From an atmospheric moisture perspective, precipitable water values (a measure of the amount of liquid water in a column of air) near 1.50", or near record territory for this time of year in the Mid-South, will contribute to high rain rates and precipitation totals that could easily exceed 2" in most areas of the metro from early Monday morning through evening. 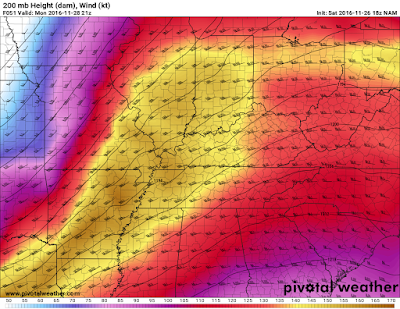 At 3pm Monday, the NAM (North American) model shows weak low pressure in eastern AR with surface wind in the 25-30 mph range (pinks) on its eastern side over the metro. A little higher up, 3pm wind at 850mb (about 4,300') is forecast to be approaching 75 knots, or 85 mph, which are extreme values. Some of that wind could be "drug" to the surface by intense rainfall, resulting in severe wind gusts. Higher yet, at the jetstream level (200 mb or about 39,000'), Monday afternoon wind is forecast to be near 175 mph. This is about as strong as the jet stream wind gets in the winter time in this part of the country and will aid the overall system strength by creating divergent wind at this level, which acts like a vacuum cleaner, "sucking" the lower level air into the upper levels. Precipitable water (PW) values near 1.50" are in the 90th percentile for this time of year. PW represents the amount of moisture in a column of air and values this high are supportive of high rainfall rates. 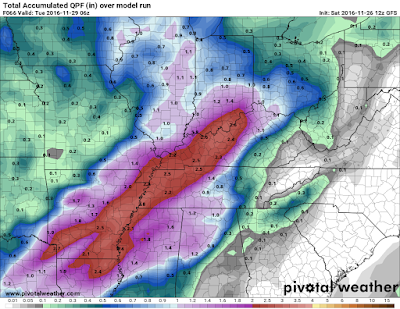 The Global Forecast System GFS/American) model forecasts 2.80" of total rainfall on Monday with a swath of very heavy rain across the Mid-South. 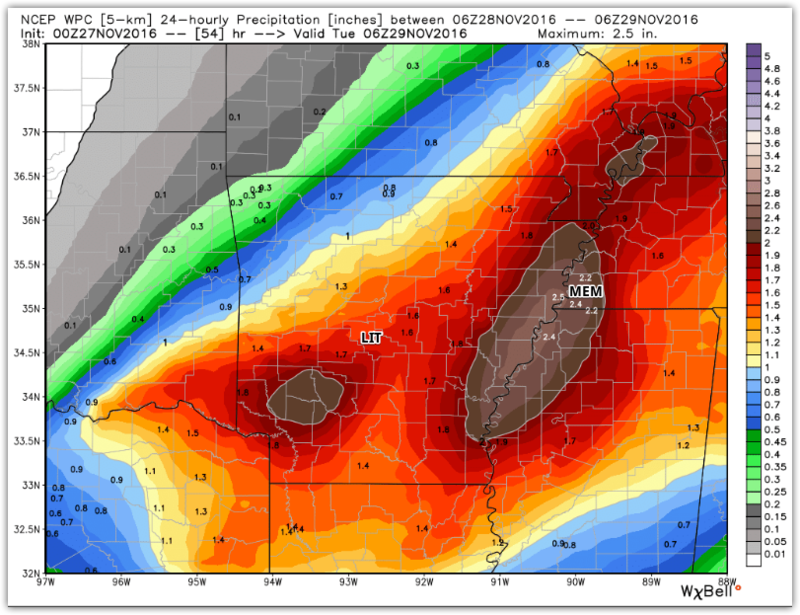 Though 6-9" of rain are needed to completely alleviate the severe drought conditions in place, this would certainly help the situation! Expect increasing rain intensity and wind values peak in the late afternoon hours. 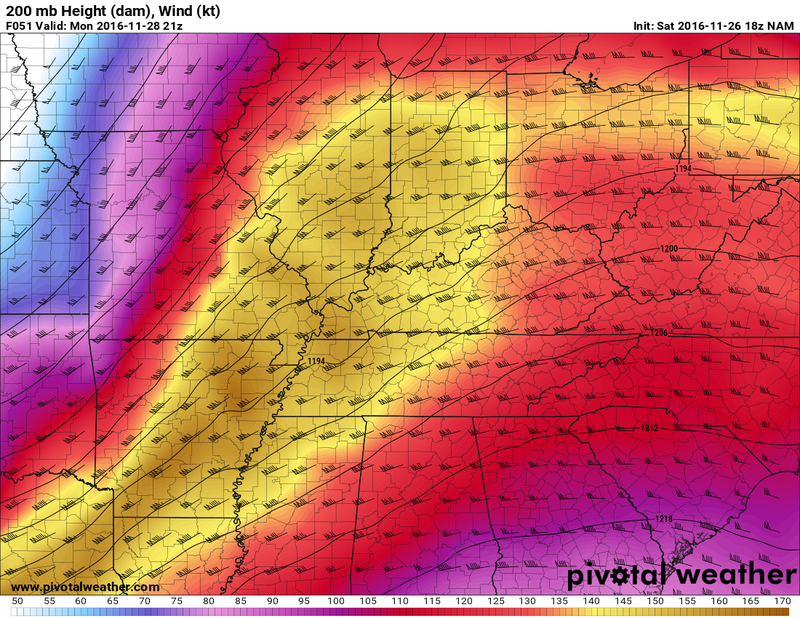 A few wind gusts to severe strength (60 mph) are possible due to very strong wind fields aloft. Total rainfall of 2"+ is expected with some areas of ponding likely, especially around afternoon rush hour. Flash flooding is possible, despite recent drought, due to rainfall intensity. Hail and tornado probabilities are low, but not zero. Plan for a wet commute in the morning and possibly hazardous weather for the afternoon commute. By late Monday evening, we expect the system to pass, wind to let up a fair amount, and rain to stop. Exact timing can still change and will be updated as necessary. 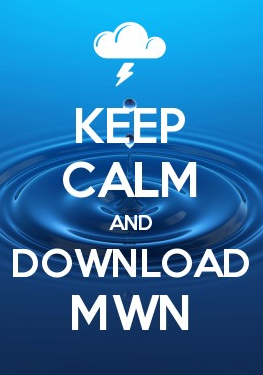 Stay tuned to the MWN mobile app and our social media feeds for the latest information.